Do you like hearing kids screaming and parents rushing their children out of the theater never to return? Me too. Listening to the questions of the young ones surrounding me, as the opening montage comprised of miscarriages and cancer progressed (“why is she crying?”) made Up quite a distinct experience, and a delightful one at that. The TV ads pronouncing the film as family friendly, filled with cute characters, talking dogs, and silly slapstick, are as misleading as someone who might tell you what a great family film Schindler’s List is. In fact, Schindler’s List is infinitely more uplifting than Up, because at least Spielberg’s film doesn’t misdirect you by opening with a charming and funny CGI short (and as is the norm for Pixar films, the short, in this case the very clever Partly Cloudy, tends to trump the feature that follows it). Up’s oppressive nature is applied with such a sucker punch over and over, that you might feel the need to be careful how emotionally invested you get in the movie, lest the situation end with a burning house or an old man clocking an innocent construction worker over the head with his cane, causing profuse bleeding, and eventual eviction from his home for the old man. 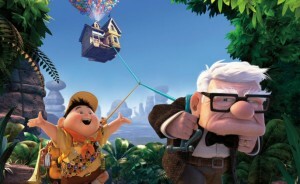 The eviction is what gets the surface story going, as the old man, Carl Fredrickson, voiced by Ed Asner, grumpy sounding, and animated to look like a mix of Kirk Douglas and his square chin and raisin nose, and John Huston with his unsettling gravely voice, specifically his creepy performance in Chinatown, finds a way to airlift his house with balloons to go on the trip to South America he’d always promised his patient, and now dead wife that they’d go on. The suggestion is obviously The Wizard of Oz, the floating house, the fantasy elements, the adding of goofy animal characters along the way, but Up is more like what would have happened had Dorothy realized how awful her life might have been, stuck on a farm in rural Kansas for the rest of her life. 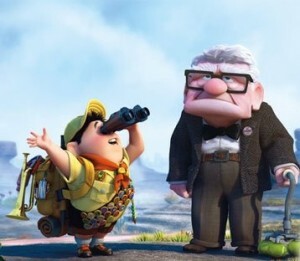 Every scene in Up is a sledgehammer reminder of how disappointing life is and how you’re just going to have to learn to accept that fact. Surrounding that nihilistic message with very funny scenes involving dogs with voice boxes linked to their brain which speaks their unedited, one-track-mind thoughts (“My name is Dug. I have just met you, and I love you…. Squirrel!”), a loyal, large, rare, and colorful bird named Kevin, and an addle-brained Cub Scout kid who gets stuck in the house before it takes off, is just downright cruel. The print we saw was in 2-D because the 3-D version wasn’t ready yet, but I can only imagine how horrifying the opening fifteen minutes and the menacing scenes on the Hindenburg-style blimp would have been with the images right in your lap. If anything, I welcome the return of the evil dirigible to the screen, especially when commanded by the “once-he’s-cast-the-identity-of-the-villain-is-no-longer-a-secret” presence of Christopher Plummer. 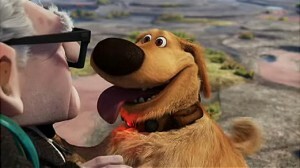 And really, there’s nothing wrong with Up as a movie, the lack of internal logic and unpredictability of the story is quite refreshing, as is the very French feeling of the film (think the satirical style of Jacques Tati), and I don’t think the sparseness of the jokes is really a problem. If anything, the minimal stops for humor make the jokes funnier because there isn’t an overload (“What’s South America like?” “It’s like America… But South”) causing the inherent silliness of a dogs playing poker gag (stolen out of Bob Clark’s final masterpiece Karate Dog), to play like a welcome respite from the surrounding elements of potential death. My suggestion? If you’re going to take someone to Up, make sure it’s a nephew you really don’t like. You’ll enjoy yourself first because the movie is actually quite good and second because you know he’ll be having nightmares for weeks. 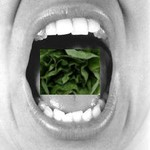 This entry was posted on Friday, May 29th, 2009 at 1:41 pm	and is filed under Action/Adventure, Comedy. You can follow any responses to this entry through the RSS 2.0 feed. You can leave a response, or trackback from your own site.